Free Microsoft Project Viewer is a free online MS Project viewer that can open any MS Project file type (.mpp, .mpt, .mpx, .xml) for any Microsoft Project version (2000, 2003, 2007, 2010). It is running on any Java enabled platform including Windows, Mac OS X, Linux and it is the perfect solution for project stakeholders to view the project details in a dynamic way. Free Microsoft Project Viewer can also be run online directly from any browser. ...... ). Using Free MOOS Project Viewer you get the possibility to see project details that no other report can give you. You can zoom in/out, collapse/expand, show/hide, resize, etc. Hence you get a free tool to view any Microsoft Project file even online directly from any browser. Why do you need Free Microsoft Project Viewer? If you receive a file generated with MS Project and you don't have Microsoft Project and you only need to view it then you need a Microsoft Project viewer. This will help you save money. There are many viewers on the market: some freeware like this one and some commercial but only some of them are really good. 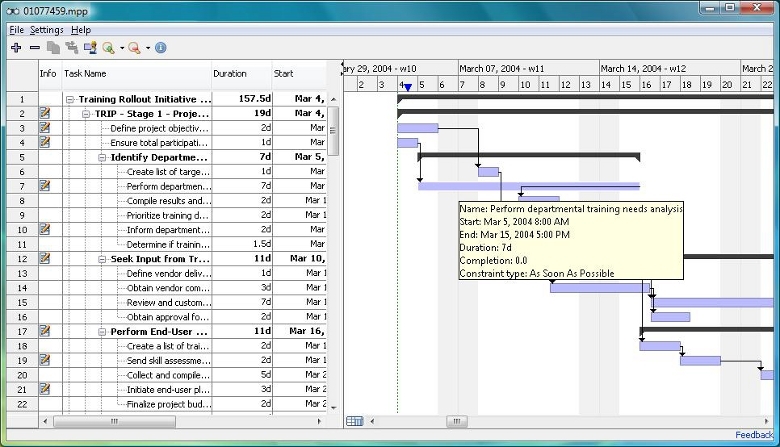 Free MOOS Project Viewer has the best MS Project viewer value that is free. What do you get by using Free MOOS Project Viewer? View Microsoft Project files without requiring MS Project. Print, Export, etc. Project Pacer paces jobs and tasks. Qweas is providing links to Free Microsoft Project Viewer 2.6.2 as a courtesy, and makes no representations regarding Free Microsoft Project Viewer or any other applications or any information related thereto. Any questions, complaints or claims regarding this application Free Microsoft Project Viewer 2.6.2 must be directed to the appropriate software vendor. You may click the publisher link of Free Microsoft Project Viewer on the top of this page to get more details about the vendor.